For more than 4,000 years, medical prescription in the treatment of alopecia has been dominated by empiricism and was based upon rough pathophysiological concepts. It is understood that hair growth is influenced by several parameters. 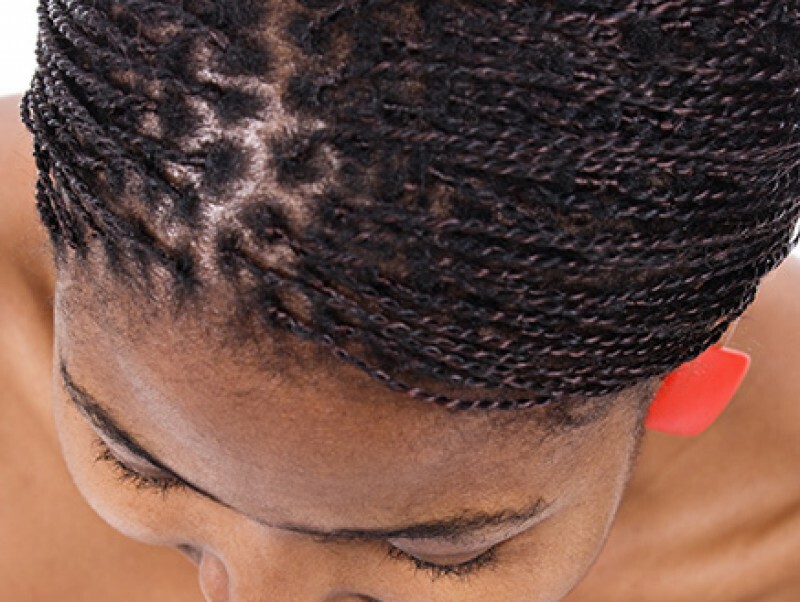 Therefore, any alopecia consultation justifies a good clinical exam and a full evaluation analysis to establish a reliable diagnosis that is a pre-requisite for any treatment. After an exhaustive physical examination and evaluation tests have been completed, it is very important to comfort patient about his condition. Physician must try to control the anxiety phenomenon associated to the disease by informing the patient about the illness and all the different treatments available. Current advances in alopecia therapy help to propose an adequate medical or surgical treatment adapted to the stage of hair loss and hair thinning process. Stabilization of hair loss will be reached after few weeks or few months of treatment. This will lead us to propose men or women a total reconstruction of their baldness through hair transplantation with micrografts done in a natural fashion. Hair micrografts help to treat similarly other alopecias such as those of eyebrows, beard, moustache and pubis. Hair transplantation with follicular units or minigrafts and micrografts is a mere technical progress. In fact, it does not only give a complete and permanent hair restoration of male and female baldness but it also brings, in a natural and painless way, hairs that will emerge in a group of 1 to 3 hairs. Actually, it seems logical to associate the stabilizing and trichogenous efficacy of various molecules to an everlasting hair transplant technique. The difference between androgenic receptors of occipital area and those of the remaining areas explains the permanent character of implanted hair growth. Stage of male and female androgenetic alopecia can either be determined according to a static classification of Hamilton (for MAGA) and Ludwig (for FAGA) or it can be measured with greater precision by the mean of Bouhanna's Multifactorial Classification. The purpose of this classification is to evaluate and follow up the evolution of male and female androgenetic alopecia if left spontaneous or with treatment (3) (Fig. 1). 10/ transplanted hairs fall out around day 15 to grow again definitely between month 2 to 4. 4/ adapt instruments choice and operating techniques to the characteristics of hair and scalp according to ethnic background (whites, Asians…) and to women. 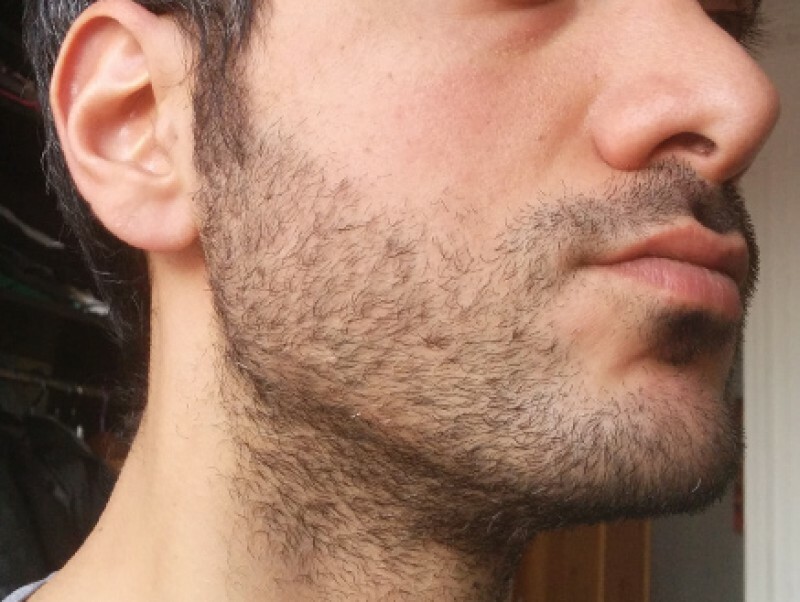 It is important to note that all attempts of hair transplant with either automatic implanters or laser did not give so far any conclusive evidence of better results than conventional surgery. 7 - Eyebrows alopecia The aetiology of the eyebrows alopecia is essentially post traumatic or after repeated hair removal. Here again hair transplant must be as fine as possible done either "hair by hair" or by harvesting hairs from the intact controlateral eyebrow. Hair direction must be oblique. The drawing of the eyebrow must be well evaluated and fitted to each individual. 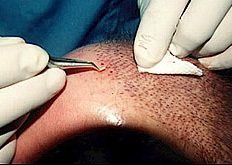 9 - Pubic alopecia (Fig. 5) For a pubic reconstruction a Japanese named (4) Tamura initially developed micrograft hair transplantation technique in 1943. Like for hair baldness, the aesthetic pubic reconstruction depends of various parameters. It is necessary to fit each individual specificity according to the etiology, the age (menopausal), the ethnic origins (Negroid, Mongoloid, etc….) the colour and the shape of hair. Schematically it is necessary to combine their finest "hair by hair" micrografts for the surrounded pubic area and the "2-3 hair follicular units" for more density of the whole area. A perfect care of the implant obliquity and orientation is always needed. 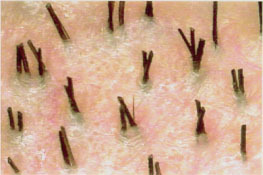 Actually it is possible with the micrograft technique to allow to male and female a definitive, natural and aesthetic restoration of various scalp or body alopecia. 1. Choi Y.C., Kim J.C. 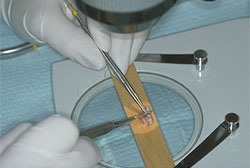 Single hair transplantation using the Choi hair transplanter. J. Dermatolol. Surg. Oncol. 1992, Nov. ; 18(11):945-8. 2. Bouhanna P. Chirurgie dermatologique esthétique du cuir chevelu, traité cosmétologie et dermatologie esthétique, EMC ; 2000, 50 : 430 A 10. 3. Bouhanna P. Multifactorial classification of male and female androgenetic alopecia. Dermatol. Surg. 2000 ; 26:555-561. 4. Tamura H. Hair grafting procedure. Jpn J. Dermatol Vereol. 1943, 52:2 (Japanese). Dr. Pierre Bouhanna : MD - Paris.